ROME — The European Space Agency plans to launch an Earth observation satellite equipped with an artificially intelligent processor that would enable the spacecraft to make decisions regarding what to image and which data to send to the ground. The satellite, currently nicknamed BrainSat, will sport Intel’s Myriad visual data processor and launch next year, Josef Aschbacher, ESA’s director for Earth observation programs, told SpaceNews on the sidelines of PhiWeek, a five-day conference focusing on the future of Earth observation at the ESA Centre for Earth Observation in Frascati, Italy. The sensor, requiring only 1 watt of power, is one of the game-changing advancements in artificial intelligence and computing technology that the space industry is seeking to harness. ESA, Aschbacher said, is boosting its artificial intelligence development team and is collaborating with leaders in the sector including Google, NVIDIA, Amazon and SAP. Last year, the Earth Observation directorate launched what it calls the PhiLab, a future-focused team working on harnessing the potential of artificial intelligence and other disruptive innovations. Aschbacher said the cooperation between ESA and artificial intelligence developers is mutually beneficial. The agency’s Earth observation satellites produce 150 terabytes of data per day — a massive data set that can’t be conveniently processed by human analysts but which can at the same time serve as an excellent source of training data for machine learning and artificial intelligence algorithms. Speaking at the same event, Planet CEO Will Marshall said that advancements in artificial intelligence and computing technology are finally unlocking the full potential of Earth observation, enabling companies to take full advantage of the resources that are currently in orbit. Last year, Planet achieved their goal of imaging every spot on Earth once a day. Now, Marshall said, the San Francisco-headquartered firm is focused on a new goal: indexing everything that’s happening on the Earth every day using artificial intelligence. Artificial intelligence, Marshall said, will cover the ‘last mile problem’ of getting the right information into the hands of the right people to help them make the right decisions when it comes to natural disasters and emergencies, climate change or geopolitical issues. Aschbacher said ESA hopes to create an AI-powered system that would bring together images from all Earth observation platforms operated by the agency as well as European national and commercial providers. This task will be challenging since data come in different formats, using different sensors and calibration. 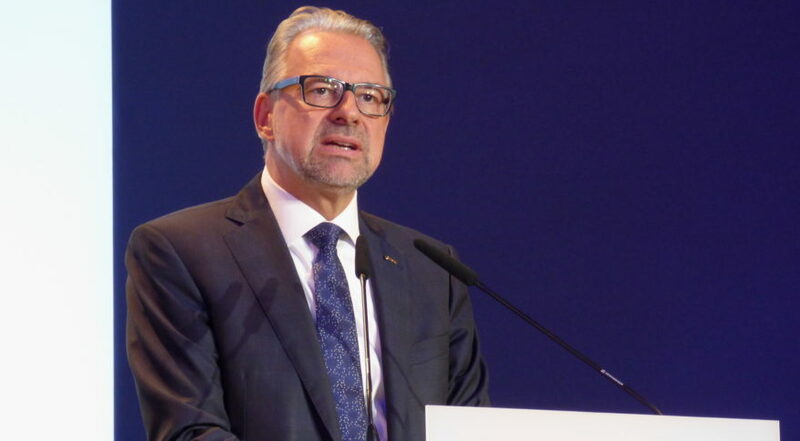 Aschbacher said he expects the development of artificial intelligence systems will be a large part of the agency’s next Earth Observation Envelope Programme that will be decided on at the ESA ministerial conference in November 2019. This meeting of ESA member states takes place every three years, and is where budgets and future activities of the agency are approved.